Wifi Camera in Pen HD - iOS / Android support - spy pen that captures high quality video and sound directly into your mobile phone. Wifi Camera in Pen HD - iOS / Android support - spy pen that captures high quality video and sound directly into your mobile phone. This unobtrusive pen camera with built-in camera and high-sensitivity microphone records videos at 1280x720 resolution while serving as a full-featured writing pen. This model is the perfect spy tool to help you capture different situations with no absolute notice. 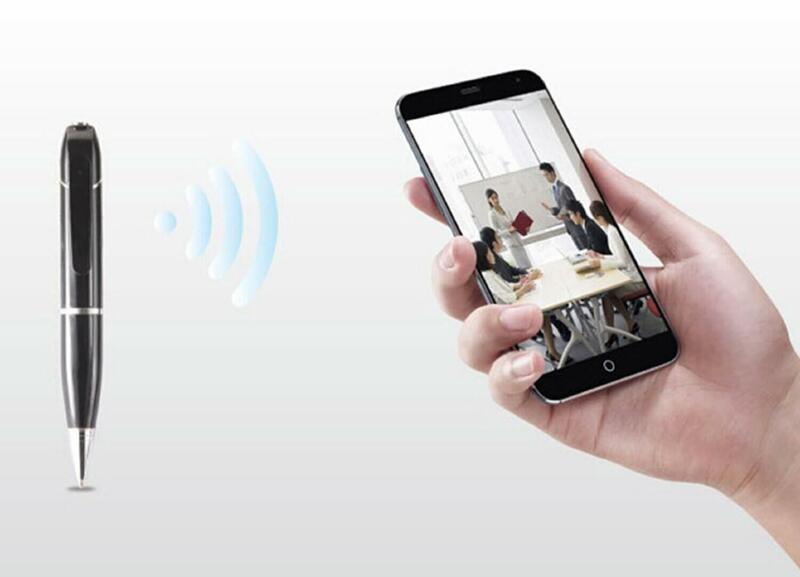 Wifi adds the ability to easily control and watch HD videos in real-time on your iOS / Android tablet or phone. You can charge the spy by simply plugging it in with a USB cable. The device supports H.264 compression that reduces the size of recorded files and together with the Micro SD card up to 32GB gives you plenty of room for your videos and photos. You can activate the spy by simply pressing the button at the top, and then the device will be ready to stand by the blue LED that is located on the opposite side of the camera. You download the p2pCamViewer application to remotely control your espionage pen on your mobile phone . Sign in to the app using pen data and then activate WIFI connection on your phone to pair both devices. With apps, you can watch online everything captured by a pearl camera while capturing videos and photos directly to your mobile phone. Miniature mini Spy camera hidden in pen. Suitable for any computer with a USB port. USB 2.0 standard and backward compatible with USB 1.1. The writing pen is fully functional for writing on paper and can change the cartridge. ey have a significant impact on overall product quality and durability. We therefore encourage customers to consider the benefits of investing and buying in the light of this.